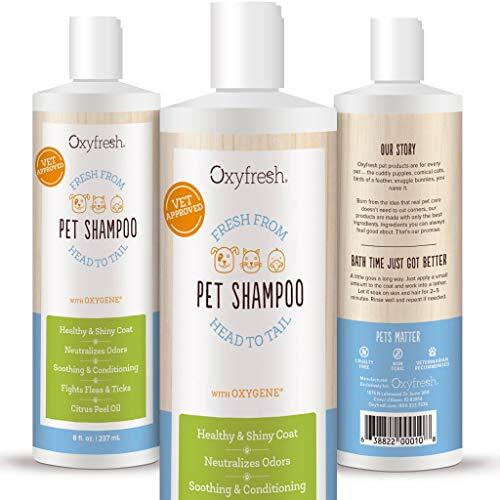 Oxygene: A Clean, Fresh-Smelling Pet is a HAPPY Pet Cuddle time is a lot more fun when your pet is clean and fresh smelling! And no product on the market will clean and deodorize your pet quite like Oxyfresh Pet Shampoo. What's our secret? Our exclusive ingredient, Oxygene. This powerful, safe and non-toxic compound doesn't mask odors ... it eliminates them entirely by safely neutralizing odors at the source. 100% Money Back Guarantee For over 30 years, Oxyfresh has provided our loyal customers with premium health and wellness products. And we want you to love our products as much as we do! We offer a 100% Money Back Guarantee (minus the cost of shipping the product) if you're not completely satisfied. Best in Show For the shiniest, healthiest-looking coat on the block, Oxyfresh Pet Shampoo is a choice that can't be beat. That's why pets, pet owners, veterinarians, and groomers alike prefer Oxyfresh! "Add to Cart" top right and let the tail wagging begin! If you have any questions about this product by Oxyfresh, contact us by completing and submitting the form below. If you are looking for a specif part number, please include it with your message.